Call today for your Napa to SFO Car Service at 1.800.380.9788. After a relaxing getaway to Napa Valley, keep the relaxation going by booking our car service to SFO. Better yet, book us for your last days stay so that you enjoy every last minute in the Napa Valley. From the moment you wake up, until you step foot at the SFO Airport you wont need to worry about getting to your destinations on time. No more worrying about being late. 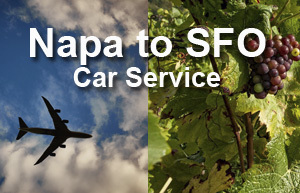 Reserve your Napa to SFO Car Service Today! Our chauffeurs are standing by 24/7 to take you from Napa to SFO. Remember to book your reservation at least 24 hours in advance. Why wait for a taxi or Uber? You may wind up waiting out in the cold. Our friendly chauffeurs will pick you up where and when it is convenient for you, any time of the day, dropping you off directly at the SFO Airport. You know how it goes – you visit a couple wineries and maybe have one too many. All of a sudden you look at your watch and your running late. That is a situation that you can avoid by booking our Napa to SFO Car Service. Let us take care of the details while you milk every last minute of time. Our Napa to SFO Car Service will be waiting to take you away. If you want to spend your entire day without any hassles, don’t bother renting a car. Someones going to have to drive, and that can always put you at risk of getting DUI. Our hourly rates are an affordable alternative to car rentals. On departure from your trip, our chauffeurs will ensure you make it to the airport with plenty of time to spare. This happens a lot at the wineries – you meet some strangers that recommend another winery. You want to go see it but its not on your itinerary. Its not a problem with us. You decide when and where to go. What if that person you met at the winery was supposed to be your destiny? You would never know if you were on a tour bus. Ready to book a car? 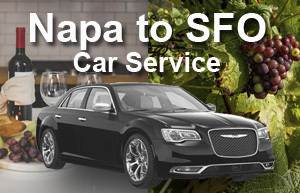 Call 1.800.380.9788 or click here to reserve your Napa to SFO Limo Service!